Another shake-up at General Electric had shares flying on Monday. The one-time Dow stock surged 7 percent after Chairman and CEO John Flannery was ousted to make way for former Danaher chief Larry Culp. In Tuesday's premarket, it was up 2 percent at $12.34 a share. Piper Jaffray chief market technician Craig Johnson says the stock still has to clear one key level before it hits bottom. "It's going to take a close above $15 to really make any sort of indication that a low has been set and that perhaps we're going to see some sort of trend change start to unfold," Johnson told CNBC's "Trading Nation" on Monday. GE shares last traded above $15 in mid-May. It would take a 24 percent rally to regain that level. While the C-suite shuffle did cause the stock to rally, Johnson says the day's moves had not yet altered the long-term trend. "The new CEO coming in is probably the right move for the company, but if you strip aside this change in management, the stock is still making a series of lower lows and lower highs," he said. 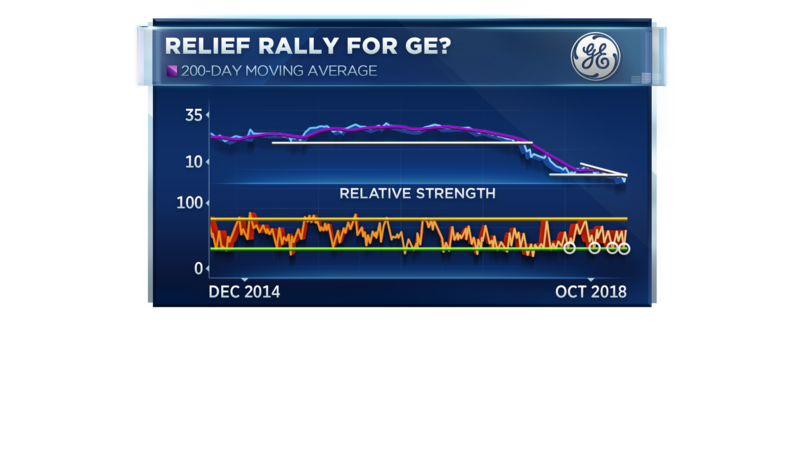 A years-long decline accelerated in 2018 as investors worried about GE's restructuring plans. In addition, its power business struggled, and fears rose that its dividend would be cut. Its shares are down 31 percent this year. Boris Schlossberg, managing director of FX strategy at BK Asset Management, is more optimistic a long-term turnaround is in the making after the change in leadership. "Mr. Culp, who is coming in, is actually very well known as ... a guy who brings in very accretive kind of deals, so he's both a good trader and a very good manager," Schlossberg said Monday on "Trading Nation." Culp was CEO and president of Danaher from 2000 to 2014, when acquisitions expanded its science and biotechnology operations. "It's very likely we could still drift back down to $10, but I think on a three- to five-year time basis as an investor it is an excellent opportunity because it is a still a pre-eminent industrial giant," Schlossberg said.